The last few times I’ve attended a hot yoga class, I’ve felt like I sweated out about ten pounds. It turns out, hot yoga gets even hotter in the summer, to the point where everyone in the room is dripping sweat the entire time. If you’re not into yoga, that might sound gross, but it actually feels good and cleansing. It feels as though your hard work is paying off, and mixed in with certain yoga poses for weight loss, you can feel the fat-busting benefits. As I’ve practiced yoga more frequently, I’ve realized that its benefits reach far beyond that of stress relief and mental health. When I first started, I took classes more for the mental advantages, but I quickly realized how it was physically benefitting me as well. Yoga prides itself on the mind, but it is an extremely physical workout that strengthens, tones and sculpts your body, and yes, it is great for weight loss. Although a full yoga workout is the most beneficial for weight loss, there are a handful of yoga poses that aid digestion, boost metabolism and blast fat due to strengthening parts of your body such as your core, arms, and thighs. If you’re looking for a new way to lose weight, look no further. With a healthy diet and regular commitment, these 6 yoga poses will help you lose weight and tone your body. Warrior one is an amazing pose for strengthening everything from your legs to your glutes to your core, and ultimately aids in weight loss. Begin either from downward facing dog or with your feet together and your hands down by your side. Step forward about four feet with your right foot, gently bending your knee into a lunge position while your left leg extends back. Turn your left foot out about 40 degrees and bring your arms upwards above your head. Tuck your belly in and keep your hips facing forward. Repeat on other side. Like warrior one, warrior two is great for strength and weight loss, and personally, I feel like it works your body even harder than warrior one. Follow the same steps from warrior one, except instead of facing forward, turn our body to the side, raise your hands up to the sides and go deeper into your front leg lunge. Turn your head forward so you are looking just past your right hand. This pose really works your back, abs, core and thighs. I have a love/hate relationship with chair pose. It’s SO tough, but I know that it is extremely beneficial for your body, strengthening your inner thighs, buttocks and core. Twisted chair pose goes one step further, adding a twist, which increases circulation in the body, and also revs the metabolism and aids in digestion. To do it, start with your feet together, raise your arms above your head and bend your knees as if you were going to, you guessed it, sit down on a chair. Make sure your knees don’t bend over your toes. Bring your palms together over your chest and twist to bring your right elbow over the leg knee. Keep your chest lifted and hold for 10 breaths. Repeat on other side. Plank pose truly works your entire body and requires extreme strength. Begin on the floor in table top position with your knees hip width apart and your hands shoulder width apart. Engage your core and left your knees, extending your legs backwards. Keep your neck in line with your spine, focusing at the top of your mat. Keep your arms, legs and core strong, and make sure you don’t dip your hips or lift your bum into the air. Hold for up to one minute. Boat pose is sure to blast belly fat, but it is one yoga pose that takes a while to perfect. It requires extreme core and leg strength, but the more your practice it, the better you will become. Start sitting on your bum, with your legs straight in front of you and your hands on the floor behind your hips, fingers pointing forward. Lift your chest and lean back slightly, making sure not to round your back. Bend your knees, lifting your feet off the ground. You will be balancing on your sitting bones and tail bone. Lengthen your tail bone, and if possible straighten your legs (this will take practice). Reach your arms forward, parallel to each other and the ground, and spread your shoulder blades. Try to hold for 10 to 20 seconds at first, and work up to one minute. This video from Indian Yoga Guru explains boat pose, and shows you a step you can take to challenge yourself even more! Bridge pose is relaxing, yet has a lot of benefits for the body. It tones the thighs and abs while strengthening the shoulders, and is known to improve digestion, which helps with weight loss! Begin laying flat on the floor with your knees bent and arms down by your side. Press into your feet, lift your hips, bringing your chest towards your neck. Engage your thigh muscles and press your hands and arms into the ground. You can also lift onto the balls of your feet if you want more of a challenge. Hold for 15 to 30 seconds, come back to starting position and repeat 3 to 4 times. Watch this video by Yoga Shala if you need more instruction or are a visual learner! If you’re looking to lose weight, these yoga poses will help you get there! They strengthen and tone, and use muscles that are sure to blast fat. Regular yoga practice combined with a healthy diet is your ticket to a slim and toned bod! 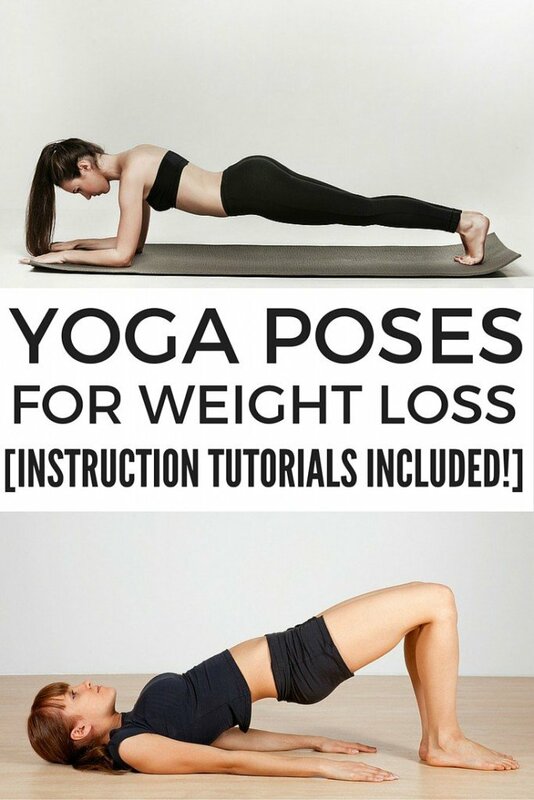 If you found these yoga poses for weight loss helpful, please share them on Pinterest!